In preparation for this race meeting during the 2 week break the SEAT has been checked over for anything coming loose. We have also put more camber on the rear wheels and removed rear wheel toe. The Vento was also checked out and also fitted with new front disc pads which would require bedding in during qualifying. Bedding them in requires getting them hot but not too hot and then stopping to let them cool down. This is usually done by doing a couple of reasonable laps without heavy braking and then stopping in the pits for at least a minute to let them cool a bit. If you don’t do this then the pads can develop a glaze which prevents getting the best out of them. We loaded the cars on the trailers Friday morning and set off down the M4 for Castle Combe which would take us about 1.5hrs. It has been a rare thing this year that when we approach a race circuit we didn't have rain. It was predicted that we would have a whole weekend of sunshine so we did not put up the awnings to save us time Saturday taking everything down as we were the last race of the day. At the circuit we had a few small jobs to do including moving the lap timer sensors from the offside to the nearside to pick up the beacon, setup the Vento tracking and changing to dry tyres on both cars. SEAT full slicks and semi-slicks on the Vento. Then it was a BBQ and a few beers. After the BBQ we had a wander round the circuit to try and get our bearings as it had been at least 10 years since we were last here. The changes we made to the seat to give it more camber and align the rear wheels paid dividends as not having driven the track for 10 years Martyn managed to qualify 4th. Martyn was on track first and setting the pace until Lee Christopher passed. Martyn then followed Lee to see if he was using any different lines or braking points so Martyn could improve his time. The session then ended prematurely, as Paul Taylor in his SEAT ran wide after missing his braking point at Camp Corner ending up in the barriers. Luckily it was only Paul’s pride that was hurt but there was a lot of front damage to his SEAT. My qualifying never even got started. On pulling out of the pit lane there was a bang and the Vento drifted to a stop. Sounded like a drive shaft or clutch failure, it turned out that one of the drive shafts had snapped. Liz and Chris Mohans’s mechanics helped get the stricken Vento back to the pits for repair. The regulations require us to complete a minimum of 3 laps of the circuit during qualifying to be able to participate in the race. The Clerk of the Course said that I could go out on the back of another championships qualifying session but we had to get the car quickly repaired as there wasn’t much time before the last session goes out. Thanks to Pete Cooper our trusty mechanic and Martyn who had finished his session by now, the Vento was just repaired in time. I was on the back of the MGBs and had to keep out of their way whilst bedding in my brakes and learning the circuit. I got in my 3 laps but as I had not been able to go fast I felt a bit unprepared for the race. At least my brakes should have bedded in nicely. Martyn is still getting used to the seat but made an average start and managed to keep 4th place. The car is showing greater promise and Martyn is getting more from it as he gets more seat time. Martyn ran with the top 3 and after a safety car period he made a couple of tries at getting past Tom Walker but without success. Martyn was happy to finish 4th and with the car in one piece. I on the other hand had an appalling race. The brakes did not seem up to their usual performance. I had to find the braking points and improve my racing lines as we were now going faster. I ended up 4th in class and very disappointed with my performance. I seemed to be slow on the straights getting out dragged by the other B class cars. There was a safety car period when Alex Dziurzynski came off at Camp when his steering snapped. I spoke to Alex after the race and he told me his data logger showed he was doing 108mph when the failure happened, 80mph when he got on the grass and 30mph when he hit the tyre barrier. Lucky the grass wasn’t wet as he would not have slowed so much. Just a timely reminder of just how dangerous racing can be. During the interval we checked the cars over and I double checked the Vento looking for anything that might have affected my performance. Nothing wrong with the car so must be that my driving skills were sadly lacking. I felt like I had “Must do better” stamped on my forehead. In the previous race there was a safety car period to enable a race car to be recovered after a crash. Once the safety car pulls into the pits no cars are allowed to pass another until they cross the start/finish line. Tom Swayne who finished in front of Martyn was judged to have overtaken before the line and was penalised with points on his license plus put back 2 grid slots putting him behind Martyn. However this was not a fortunate slot on the grid for Martyn as the driver in the race before had dropped fluid in the grid box which meant that Martyn got a really bad start and dropped to 5th straight away. He soon got past Richard Morgan for 4th but by this time the leaders had pulled away a bit and so he ended up having an uneventful race on his own to finish 4th. I took time while sitting in the collecting area waiting for the start of the race to run through the corners in my mind trying to work where I could brake later and improve my lines. I got a reasonable start and being on the outside of the grid meant I was on the inside for Quarry which helped me get into 3rd in class. Braking hard for the Esses I saw Chris Mohan who was currently 2nd in class B have a bit of a moment and I slipped past putting me into 2nd in class. The rest of the race was a bit of a lonely affair as having sorted out my lines and braking points I pulled away from the cars behind me but was not able to close on those in front. I finished 2nd in class B. I was much happier with my performance having improved my lap time by 2 seconds a lap. Usually the last race of the day is done in front of empty spectator areas but I was amazed to see spectators still on the banking watching the racing and they were still there at the end of the race to applaud us when we finished. A great thank you to all those spectators. With the change of car from the VW Beetle RSi which ended life at Silverstone to a new Seat Leon Cupra R we were hoping for a better weekend of racing. With the new car bringing hope the weather did nothing to help as it would seem that anytime the Maximum Group VAG trophy gets anywhere near a race weekend the weather goes to pot with rain forecast for Friday through to Sunday evening. I loaded the Vento onto the trailer on Thursday to avoid the predicted wet weather but we had to load up the SEAT in the rain on Friday. So started a bad day. We set off at 12:00pm with the hope of getting to Snetterton by about 3:30pm. We immediately hit traffic on the Newbury bypass and ended up when possible turning around and travelling back out of Newbury by the same route we came in to get on the A34 South of Newbury at Tot Hill services. We joined the M4 at J13 heading east which slowed to a crawl in many places especially at the M25 junction. There were signs warning of long delays on the A11 which is the route we wanted so we ended up taking to the A10 instead. What we did not know was that the A11 delays were southbound which would not affect us. Why warn traffic that would be travelling north on the A11 that there were delays southbound. I just don’t understand what the mentality is of the people who operate motorway signs. After all the messing about we arrived at Snetterton at about 6pm in the pouring rain. We put up the awnings so that we would at least be able to work on the cars Saturday, Sunday and stay relatively dry. It was raining for qualifying and so for Martyn it was never going to be easy getting used to a new car. Also being a turbo makes it harder to drive in the wet so it was going to be tough. Martyn took it steady learning how to drive the car and managed to secure 6th on the grid. It was a good session as the car stayed on the track and Martyn just needed seat time to get used to the car more and more. Wet conditions are a great performance leveller and I finished qualifying in 3rd place in class B and was in front of several of the class A cars. By the start of the race the rain had stopped and the track had dried out. It was going to be a tough first race for Martyn as it would be the first time he had made a standing start in the new car. Paul Taylor a team mate was very helpful as he has the same car so he helped with giving advice on engine revs to start the race with. However even with this advice the start was still difficult and Martyn stayed put in 6th but as the race went on Martyn slipped to 7th and he ran wide with 3 laps to go. Coming back on track buckled a front wheel which caused a lot of vibration and meant Martyn wasn’t as quick as before. He made the decision to race for 10th which would give him pole for race 2 as the top 10 grid places would be reversed. It was great for him to finish race 1 in the new car without further mishap. I for one was very relieved not to see him at all during the race which meant he had not broken down or got bogged down in the gravel traps. I seem to lose out at the start of the race resulting in my having to make up a lot of lost time so this time I was determined to be more aggressive from the start. During the green flag lap I made sure my tyres and brakes were both warmed up so I could push harder straight away. To my surprise this worked well and I soon took 2nd position in my class which I held to the finish in what was an uneventful race. It was a surprise as the weather cleared and it was time to change the anti rollbar settings on the SEAT in order to set the car up for a dry race. However due to 2 red flag incidents in the GT Cup our race start was delayed and then the rain started. Luckily the rain didn’t last long and was only a light drizzle. So slicks were still the order for race 2. For Martyn starting from pole was going to be a challenge as he was still learning the best way to get the car off the line properly. Martyn got an average start but the chap in grid slot 2 made a worse start as he lost 2nd gear. Carnage ensued causing a red flag and the race to be stopped. Martyn was in 2nd when this happened. But when the race was re-gridded for the restart Martyn got the chance to start from pole again. However the start was worse for the 2nd start and Martyn slipped to 7th but he was staying with the pack. Martyn was happy to have finished the 2nd race in 7th place. The accident at the start happened in front of me and I had to dodge the damaged cars which were going in all different directions. Luckily I managed to miss everybody as I had taken care during the green flag lap to make sure my brakes were hot and would stop me quickly. On the restart I had a good start but in the middle of the 1st corner I was hit hard in the driver’s door by an over enthusiastic driver who either ran out of brakes or talent. There is a saying that this driver should keep in mind “You can’t win the race in the 1st corner but you can definitely lose it” which was very prophetic as he had to retire from the race. Luckily it did not affect my cars handling and I managed to finish the race 2nd in class B. The earlier accident had caused Chris Mohan not to start the race which meant that I had a points advantage over Chris making me 2nd in the Class B championship. During the interval we removed the door liner and pushed out some of the dent but we were unable to do anything about the dented door sill. I won’t do anything about replacing the door or sill until the winter break as I am sure that if I do a proper repair it’s bound to be hit again in the same place. It started raining quite hard for race 3 so it was time to change to full wet tyres and change suspension settings on both cars. Martyn started in 7th but as he was still getting used to the car Martyn slipped to 8th behind the fast starting Rob Allum. Martyn took the chance to chase Rob down hoping Rob would make a mistake causing him not to finish which would give me the chance to gain points on Rob in the championship. Rob was starting to slide in the corners and eventually he spun but he stayed on the track and only lost 3 places but none to class B cars. Martyn finished 7th again. When Martyn got into parc ferme after the race he let out such a yell having finished all 3 races which had not happened for a long time. The scrutineer said it was like Martyn had just won the championship but it was a great feeling for Martyn to finish all 3 races. I think I go in car and self preservation mode when I drive in the wet. I didn’t do anything spectacular or take any undue risks. I finished 3rd in class B behind Rob Allum and Chris Mohan. This meant that Chris had closed up a couple of points but I was still comfortably 2nd in Class B. Our next race meeting is in 2 weeks time on the 8th August at Castle Combe. During the break we checked the accessory belt pulley alignments to see if this could be causing the belt shredding problems on the Beetle. There was a misalignment of about 1.5mm between the alternator pulley and tensioner. This misalignment we sorted out by fitting various spacers and then using a 5 ridge belt instead of the 6 ridge one. This enabled us to bring the alignment within 0.1mm between all the pulleys. Let’s hope that fixes the problem. On the Beetle new brake ducts were fitted to ensure a good flow of air to the brake discs, the brake fluid was changed and 4 replacement slicks fitted. On the Vento the inner drive shaft CV joints were greased. Due to getting 2nd in the last race at Brands the additional success ballast took the overall weight above the current weight of the car and 5Kg of weight had to be bolted in. Both cars were then setup ready to race. The weather forecast for the weekend was pretty dire. At least on Friday we managed to get the cars unloaded and the awnings up before the rain started in anger. We had planned on having a BBQ on Friday night which we still did under a friend’s awning even though it was raining hard. On Saturday morning the rain was stop/start with short drying spells so it was decided to put both cars out on wet tyres with dry suspension settings. For Martyn this worked like a dream as he was on pole up to the last lap when the weather got worse so he decided to end the session and park in the pits as he wasn't going to go any quicker plus he didn’t expect anybody else to go quicker. However one car did go quicker putting Martyn into 2nd place but this was a great place to start as it was on the inside line for the first corner. It was a good performance from a car that has been unreliable. This was the last race scheduled for Saturday and the track was still really wet. We kept the cars on their wet tyres and softened the suspension to their full wet settings. Race 1 started well for Martyn and he was in 2nd place but then slipped to 3rd when Paul Taylor passed. This was short lived as Paul out braked himself and so Martyn was 2nd again. This again was short lived as the screen misted up meaning Martyn struggled to see braking points and corners. He did however finish 5th and was glad to finish. On the way to the start line Rob Allum the class B championship leader pulled over with what turned out to be a broken drive shaft. This I thought gave me a chance to win for a change. The track conditions were awful and although I did not have the windscreen misting up problems that some others suffered visibility was very restricted i.e. nonexistent. So much so that I ended up blindly driving into the spray hoping nobody had done anything silly in front. I also had to assume that those in front that could see, had hit their braking points and I just looked for their brake lights. I was very surprised that it was not stopped as the visibility was so poor but the race went full length and thankfully there were no serious accidents. I was in a pack of several cars when the race finished and we missed the chequered flag as there was no repeat flag further down the track. This meant we took the chequered flag twice which resulted in us all having to pay a visit to the Clerk of the Course. He was very good about it as the visibility was so bad and just gave us a verbal reprimand. As it turned out I did come 1st in class B which meant a further 20Kg of success ballast to be added to the car ready for race 2 on Sunday. It had stopped raining overnight so the cars were restored to their normal dry suspension settings. 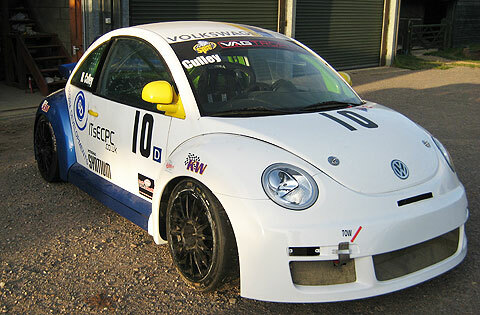 The Beetle was put on slicks and the Vento on the Dunlop DZ03s. A reversal of grid positions was used for this race. The top 10 A class cars had their positions reversed i.e. the car that finished race 1 in 10th started this race on pole. Due to the reverse grid Martyn started 6th and was up to 5th but due to accidents the safety car was deployed and so he slowed as per regulations but other drivers saw this as an opportunity to overtake and so he slipped to 8th. When the race got started he was straight back up to 5th when the engine decided to explode in a very big way at the end of Hanger Straight. Apparently the fireball was bigger than the car. This was the end of his weekend which promised so much. All B class cars were put to the back of the grid and their positions reversed so the slower cars were at the front. This meant I was at the back of the grid next to Rob Allum as he was a non finisher in the 1st race. During the green flag lap I always make sure that my brakes are hot as well as my tyres. I have seen too many accidents on the 1st lap to take any chances with not being able to stop. This turned out to be a good move as there was a major accident between Maggotts and Becketts corners with cars spiralling across the track. I had to brake hard to avoid the cars that crashed into the carnage and the debris on the track. It quickly brought out the yellow flags and the safety car which we followed for several laps. I was behind Doran who fell back from the other cars and did not close up even when the safety car switched off its lights signalling that the race would restart at the start/finish line. All I could do was ensure I was alongside but not in front when we passed the line. By this time the other cars had disappeared from sight around Copse Corner. All I could do was to press on and hope I could close the gap on the cars in front. I managed to get to within 1 cars length of the car in front which was Chris Mohan who is also in class B. I was hoping for 1 more lap but the chequered flag came out and I had to settle for 3rd in class B, behind Chris 2nd and Rob 1st. A further 12Kg of success ballast had to be bolted into the Vento and the car check over. As we were racing late in the day we packed up our awnings and stowed what equipment we could before the race. There was a drivers briefing called as there had been several overtaking under safety car incidents in race 2 and the Clerk of the Course wanted to impress the regulations on everybody and to let them know he would tolerate such behaviour. Grid positions for this race was determined by the finishing positions in Race 2. I started on row 8. At least this time there were no accidents on the 1st lap with everybody behaving themselves. Rob Allum disappeared off in the distance with Chris Mohan as I got into my stride. My car seems to come into its own in the 2nd half of the race and it was from that point I started closing in on Chris again. When he came off on Maggotts Corner I knew he was getting worried. I closed quickly on him under braking for Brooklands corner at the end of the Wellington Straight and positioned myself for an undercut on the exit of Luffield. As Chris followed the racing line out of Luffield I came out tight and passed him. When you are chasing somebody the thought goes through the mind, one more lap that’s all I need to catch and pass but once you are past you are hoping the chequered flag comes out. Needless to say there was no chequered flag and it was my turn to be chased for a few laps. I finished in 2nd place in class B. Still more success ballast to be bolted in the Vento which will take me to the maximum ballast weight of 85Kg that we are allowed to carry. As a team we have taken the decision not to build another engine and will instead break the Beetle for parts as the sum of the parts is greater than what we could sell the whole Beetle for. We have acquired a new race car being a Seat Leon Cupra mk1 with higher hopes of reliable racing. Here's hoping for better from the next meeting at Snetterton in Norfolk on July 25th and 26th. The weekend had an inauspicious start when setting up on Friday ready for the weekends racing. On unloading the Beetle from the trailer a power steering pipe exploded, spreading power steering fluid across the tarmac in the pits. Converting from the mechanical power steering pump to an electric one was one of our winter modifications in an attempt to reduce the length of the accessory drive belt and therefore reduce the load on the belt tensioner which seemed to have a habit of breaking. 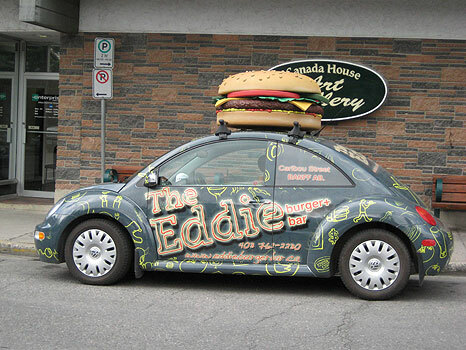 The Beetle had only been moved about gently at home and this modification had not been truly tested. Martyn was quickly on the phone to Pirtek who have mobile hydraulic repair vans to see if they could fix it. Fortunately they had a guy out to us within the hour so Martyn’s race weekend wasn’t over before it started. With everything setup it was time for a BBQ and a beer. The day started wet but soon dried so there was no question of which tyres to use, slicks were the order of the day. The Vento is now in Class B and is fitted with Dunlop DZ03 tyres which are road legal semi slicks so no question there over which tyres to use either. For Martyn things didn’t go according to plan. He spun on his first flying lap coming out of paddock hill bend doing a double donut down the hill. The tyres weren’t quite up to temperature and the new electric power steering conversion was taking some getting used to as it makes the steering much lighter. The troubles didn’t end there as the accessory belt shredded and so that was the end of qualifying as he didn’t want the engine to overheat. Fortunately he still managed to qualify 7th with the prospect of being able to reduce his lap time in the race. For me in the Vento I spent most of qualifying working out how much grip the DZ03s had. They are 225s which are 20mm wider than the slicks I was used to and I was quite impressed. I qualified 3rd in class but I felt confident that I would go better in the race. For Martyn this race was almost a non event as not many laps into the race the accessory belt shredded again and he stopped save the engine. The race had been going well as he was getting used to the steering but the issue now was to try and find out why he was shredding bets. I had a bit of a problem start. My grid position meant I was on a slope and not having a hand brake meant I had to keep using the brakes to stop from creeping but also watch the lights carefully to get my engine revs up to pull away. Having managed to start without creeping too much I found myself behind a very slowly moving car, the gap to the right was already full of cars so I went to the left which meant I had all 4 wheels on the grass. Without much grip on the grass I found myself to be last by the first corner and had to then make a race of it. I moved up several places until I was behind a Class A Mk5 Golf fitted with the wide wheel body kit which then proceeded to weave whenever I attempted to overtake. I was now second in my class. I realised that there was no way I could catch the leader in my class he had too much of a lead and therefore attempting a risky overtaking manoeuvre wasn’t worth it especially as on one of my attempts he pulled over on me damaging my front wing. I finished the race 2nd in class and when I got back to the pits I went and had a word with said driver, pointing out to him that weaving is not allowed and the rule is that he can make one defensive move and then has to stay on that line. He said he was still learning although he did not have a novice cross on his car and had not appreciated the detail of the no weaving rule. I gave him the benefit of the doubt this time. During the interval between races Martyn and Pete changed the R32 alternator to a mk3 golf alternator thinking that the R32 alternator clutch pulley might be causing the belts to shred. The Vento was given its usual spanner check to make sure nothing had come loose and fluid levels were ok.
Martyn had to start at the back of the grid as he was non finisher in the first race. He made an average start but was making his way through the field very quickly diving into every possible gap. He was up to 7th chasing the pack in front which he anticipated catching on the last lap. However issues with the car again caused a premature end to his race. This time it was front brake failure and typically with his luck this was at the fastest part of the track. With the rear brakes working and the car travelling at 110mph hitting the brakes caused the car to spin on the turn in to Paddock bend. He was then working frantically to keep the car out of the barrier and make sure he went into the gravel backwards but in a straight line to ensure the car didn’t roll. I had a better start as we weren’t held on the line under red lights as long as in the 1st race and everybody got away ok. There isn’t much to report about the race itself although I ended up on the tail of the same car as in the 1st race. The difference this time was that he applied what I told him regarding weaving and was much better. I was faster through some of the bends than him but I was unable to keep with him in a straight line. His was an A class car which had a turbo, 9” fully slick tyres compared to my 7.5” semi slicks, full independent suspension and higher power output, so I was quite pleased with my performance finishing the race in 2nd place again. I just need to work out now how to improve my performance so I can challenge the leading Class B car that won both races, well done to Rob Allum. With the cars at home it has taken some time to remove all the gravel. We are now trying to find the cause of the Beetle’s brake failure and also investigate the belt shredding. We are currently putting the brake failure down to disc cooling issues so we are making changes to the air ducting and also replacing all the brake fluid in the car just in case it absorbed any water. With the belt shredding we are checking the alignment of all the pulleys and will adjust them to ensure that are running in line. The spins flat spotted the tyres so all 4 will need changing before the next race. The Vento has been checked over and the inner CV joints re-greased as they tend to dry out. It just needs s bit of wing/bumper repair and then setup tracking and corner weights. Next race is Silverstone on the weekend of 13th and 14th June. The engine build is finished and the replacement engine fitted into the Beetle. Having fitted new rings, big end shells and main bearing shells the engine needed running in. Finding somewhere to run in an engine in a race car proved to be very difficult considering the noise levels and speeds entailed. It needs to be run under varying loads starting at relatively low rpm and building up to maximum rpm. In the end it was decided to run it in on the Championship rolling road at Marlin Motorsport in Bletchley where Martyn their specialist has done this before. The engine would normally run on a fully synthetic oil but to run it in especially the rings it was filled with a mineral oil which would allow the rings to bed in properly. It was run for 20 minutes at about 2,000 rpm and then allowed to cool down so we could check for leaks or anything loose. It was then run for a further 20 minutes at increased load and slowly increasing the rpm from 2,000 to 4,000 over the time. Again it was allowed to cool and checked. It was finally run for another 20 minutes this time varying load and rpm up to the maximum 7,500 rpm. All seemed fine and with the engine now run in we could prepare for the Championship power measuring run. After cooling down, the oil filter was changed and the oil changed to fully synthetic engine oil. The Beetle was then put back on the rolling road and two power runs were made with the engine being revved to its maximum each time. The power results were within 0.5 hp of each other and this deemed satisfactory for the Championship power declaration. It was 3-4 hp less than we wanted but as it’s a new engine we would expect it to loosen up a bit which should increase the power slightly. The car now needed setting up ready to race. This mainly consisted of setting up the ride height, tracking and then adjusting the corner weights. Corner weighting is done so that we get the same weight transference on braking into both left hand and right hand corners. To achieve this we put the car on scales which are under each wheel. Because we work on a power to weight ratio the car plus driver and end of race fuel has to be a minimum weight. This is achieved by fitting ballast weight in specific locations to roughly achieve the required balance and then fine tuning by adjusting the corner heights using the adjustable platforms on the suspension units. The Vento will be entered by me in Class B which means I have a maximum power of 230 hp and have to run on semi slick tyres. With a clean and a polish the cars are ready to race. So roll on Brands Hatch on the 16th May when we have our next race on the Indy circuit. We will keep our website updated with how we get on at Brands. There will be A and B Classes which both have the same power to weight ratios. The difference between the two classes is mainly that Class B are limited to 230BHP at the flywheel, have smaller brakes and run on road legal semi-slick tyres. The regulations now require all cars to be power tested on the championship nominated rolling road at Marlin Motorsports based in Bletchley. This change plus the appointment of Ian Billett as the eligibility scrutineer should ensure that all the cars conform to the regulations and should be of similar performance. The main point that we are concerned about is that to try and equalise the performance differences between the cars fitted with turbos and those that are normally aspirated a 40Kg reduction in base weight has been given. We are not sure that this weight reduction is sufficient to compensate for the extra torque and the resulting performance gain that the turbo cars have over normally aspirated. Time will tell as the championship progresses but the organisers are committed to balancing the different cars performances. When power testing the Beetle on the championship rolling road, the tester terminated the test early when he felt vibration in the clutch pedal. On getting the car home we removed the gearbox expecting to find that we had a clutch failure but it was ok. Next we checked that the flywheel had not come loose and that was when we noticed movement of the flywheel and crankshaft but no corresponding movement at the crankshaft damper end. Quickly removing the sump confirmed our worst fears that the crankshaft had snapped. On subsequent stripping down the Beetle engine it was found that although the engine had still been running the crankshaft had indeed snapped in two. This had caused the shells in the big end of connecting rod five to rotate round on each other plus pickup on the piston and damage to the cylinder head. With two weeks to go before the first race of the season it was too late to rebuild or replace the engine so it was decided that Martyn would drive the Vento in the first race meeting at Snetterton in Class A. We would try and get the Beetle ready for Brands Hatch in May. We've just had the latest TV schedule for Motors TV which are showing the latest rounds from Snetterton. The races will be shown on Full Speed Racing to be shown on Friday 5th July at 6:45pm and then repeated at 12:15am the following day followed by a further repeat on the 8th July at 11:45am. Just an update on the Goblin Racing team, what’s happened to date and what we will be doing in 2012. The Snetterton 300 in the middle of October went ok for me but the Beetle had more electrical issues. I am not writing a report on the race as it was televised and a video of it is on the VAG Trophy website which you can go to by clicking on the link. Quite a bit of the race was from my in car camera so I have had my 15 minutes of fame with my name being mentioned a few times. The Birkett relay at the end of October did not go well. Of the 5 cars we had in the team 3 did not finish the day. The Beetle suffered with cut out problems and the usually very reliable 4WD Golf of Paul Taylor and my Vento both withdrew with engine problems. Paul’s developed a bottom end rattle in practise and the Vento’s engine seized solid after two 40 minute race sessions. We are now in the 2012 season preparation period. We will be racing in the VAG Trophy again, our budgets just do not allow us to race in the VW Cup anymore unless any sponsorship comes along. The Beetle has had the ECU changed. We have also rewired it to spread the power loading over several relays and circuits. This will enable us to isolate circuits should we get any future issues. We are also looking at ways of reducing the overall weight as it is a bit heavy. Other than that it’s ready to go. The Vento is another story. When I dismantled the engine I found that the crank timing wheel had come off. It became fragmented, mangled up and a large piece jammed between the con rods and the block, stopping the engine instantly. Whilst the bits were flying about they also managed to damage the pistons, block and con rods. It’s been decided to write the engine off as most bits were either damaged or we think stressed too much for a high revving race engine. We still have the 2.8l engine we took out of the Beetle when we bought it and we are currently fitting that into the Vento. Work is not progressing as quickly as we would like as we have had some personal issues. I am proud to say that I am a grandfather again with Martyn’s wife Manda giving birth to Jamie Sidney Culley, a strapping 8lb 14oz boy. During the 2nd half of last year I was suffering with a hip problem. I had a hip replacement in January which means I can’t do much on the cars for a little while. It’s best not to overdo things at the early rehabilitation stages to ensure I don’t get problems later, so I am following my Physio’s advice with daily exercises and walks. It’s the climbing in and out through the roll cage and the contortions I have to go through that’s the main issue but I should be ok for the start of the season and so should the Vento. We are both looking forward to the 2012 season in the VAG Trophy and you are welcome to visit us in the pits. All rounds of the VAG Trophy will be televised so look out for the broadcast times which we will put up on our web site. May you all have a happy and prosperous 2012. At long last we have finished the repairs after its serious accident at Rockingham last year. The front subfame, rear axle, hubs, radiator, oil cooler, alternator and a host of other bits had to be changed and fitted once the body shell had been straightened. Jim at Wigmores Garage, Bucklebury even broke a 10 ton chain trying to straighten some bits, it was very close to being declared a write off. Still it’s been running and has been on the rolling road with good power, so it’s good to go and with its new colour scheme (see picture below). Both the Beetle and Vento will be racing this Saturday 20th August at Brands Hatch on the GP circuit in the VAG Trophy. Further information will be available shortly together with the Championship Registration information, power test dates and a pre season track day at Silverstone on March 20 2011. In case you missed it Motors TV will be showing the season re-run of the Volkswagen Racing Cup. Our apologies for not updating the site recently. However we are back up to speed. Martyn will be racing the Vento this weekend at Brands Hatch. So check back next week to see how he got on. Check out our Results page to see how we got one at Zandvoort and Silverstone. "Think we have found a new body for the Beetle, just needs a roll cage." As with the start of every season Adrenalin Motorsport with Goblin Racing cars have been on the rolling road to check power and then the engine has been sealed and map taken by the championship scrutineer. The Beetle has been through this process twice as we weren’t happy with the power curve and so some changes were made but this made things worse and so the original map was put in the ECU and time will tell if it works out. Martyn will drive the car as hard as he can to make sure he pushes the car to it full potential. The cars are now going through there last stages of preparation before the spares are organised and then it is a matter of loading up the cars to be transported to Oulton Park. We will be heading to Oulton Park on Saturday night to setup the paddock on Sunday with an organised trip to the pub on Sunday for meal with the other members of Adrenalin Motorsport before a day of racing on the Monday. Anyone coming to Oulton Park come and see us and we will be happy to talk to you. Fingers crossed for a great season. As for the Goblin Racing cars things have moved forward in that the gearbox has been changed, changing the diff from a quaife to plate diff to aid traction out of the corners and in affect replacing the one Martyn destroyed at the start of 2009. This should help improve laptimes for Barrie. The Beetle has been tuned on Storm Developments rolling road and this is going to be followed up by a session at Superchips to check the power before the official rolling road session for the championship at the end of March. Then both cars will have their pre season checks and be setup for the first race at Oulton Park including the changing of any championship stickers that need to be replaced on the cars. Its not long till the first race of the year so it is full steam ahead to make sure both cars on on the grid Easter weekend. Following the success in the Birkett Relay race in 2009 Goblin Racing will be making an attack on the teams championship in the volkswagen racing cup joining forces with Fast and Furious Motorsport to form Adrenalin Motorsport. Drivers will be Goblin Racing pairing of Martyn and Barrie Culley and Fast and Furious Motorsport pairing of Paul Taylor and Darren Blumson. In addition the team will be joined by new driver Tony Taylor who is making his first appearance in the championship in a Golf VR6. 2010 hopefully brings an exciting year of racing. We are doing everything to ensure we have both cars racing at each meeting this year. In fact Barrie has really started preparation early. The VW Racing Cup is celebrating 10 years in style. A new sponsor and it's first ever overseas race meeting at Zandvoort in the Netherlands. The new sponsor is Fuchs Lubricants the world's largest independent lubricant manufacturer, which plans to use its association with the championship as a platform for increasing awareness of Titan, the company's superior range of automotive lubricants. Saturday 24th October 2009 is the historic Birkett 6 hour relay race held at Silverstone race circuit. Barrie and Martyn with further VW racers Paul Taylor, Darren Blumson and Tony Harbermann are entering as “Team Volkswagen ‘Boys R Back’”, a play on the fact that Paul, Darren, Martyn and Barrie all previously raced with “750 Motor Club” who are hosting the event. We also have a non VW racer in the team Tony Taylor, Paul’s dad, in a Toyota MR2. There are 55 teams, each with a minimum of 4 and a maximum of 6 cars and drivers. It is a relay race with only one car from each team on the circuit at any one time. The handover is achieved by the car coming in from the circuit having to pass the team’s pit garage in the pit lane before the next car can go out onto the circuit. With such a large number of cars it is obvious that there are also a wide variety of cars, too many to mention individually. A flavour of the type of machinery there will be: Morgan’s, Westfield’s, Caterham’s, Radical Clubsports, BMWs V8 GTR and M3s, Fisher Fury, Ginetta, Porsche, Mallocks, Sprites, Midgets, Jaguar XKs and XJs, Tigers and lots of others I have never even heard of before. 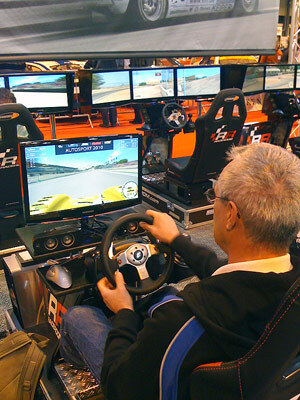 To cater for the range of cars competing and their different levels of performance, the race is run on a handicap basis to try and even everything out. This is very complicated and I could not even attempt to explain it here, especially as I don’t understand it myself. We leave that to the handicappers. It should be a hectic but fun race which we are all looking forward to as the closing event to our 2009 racing year. Come back and visit our site to see how we got on. This weekend coming sees the final 2 races of the season. Both the Vento and the Beetle are primed and ready and will be racing at Brands Hatch. If you're coming to the meeting, why not pop round and see us in the pits, we'll show you round the cars. Both cars hit the Silverstone Circuit last weekend, with Martyn having one of his best race weekends for a while. Visit the Results page to see how he got on. This weekend sees the Silverstone meeting kick off. For the first time this season we will have both cars racing. It will be the Beetle's first outing. Qualifying starts on Saturday at 11:20 with Race 1 at 16:10. Race 2 is on Sunday and gets under way at 12:25. Snooker Star Ronnie O'Sullivan is due to race in the VW Racing Jetta. Why not follow the live timings all weekend. Click here for more details. Motors TV is available on Virgin Channel 545 or Sky Channel 413. Several races are coming up, Snetterton, the re-scheduled Donington meeting and Silverstone. Barrie will be entering the Vento at Snetterton whilst Martyn takes a break to raise funds to get his Beetle RSi back on the track. We hope to be racing both cars at Silverstone but unfortunately neither car will be at Donington. Unfortunately Goblin Racing will not be racing at Knockhill. The next time the cars grace the track will be at Snetterton in July, when hopefully both cars will be racing. Again a set of mixed results from the Rockingham Race meeting. Martyn finished 9th in the first race and a disappointing 12th in the second race, Click here to visit the results page and view the results and reports. The Beetle is proving to be a tricky little car to get on the track this year. It just isn't performing as we would want it to. In light of this we've decided that we won't put the car on the track until we can ensure it's going to be competitive. So Martyn will be racing the Vento whilst Dad sits and watches until the day this bug is ready to burn rubber once again. Donington Race Meeting postponed. Problems with some earthworks and obtaining race licences has meant the postponement of this meeting. More information will follow shortly. Visit www.crash.net for more information. Martyn puts the Vento on the second row for Monday's first race, finishing in 3rd spot in today's qualifying. Martyn came in with a time 1:57:91 just over a second behind Pole Winner, Liam Griffin in the Scirocco 2.0 TSI GT. In second place was James Walker in the Mk V Golf 2.0 Gti. This weekend sees the start of the new season and unfortunately there will definitely be only one car racing at Oulton Park. Martin will be driving the Vento as Barrie stuffs his face full of Easter Eggs and apparently Fruit Cake. If you are at Oulton Park this weekend why not pop over to the pits and see Barrie and Martyn and get an insiders view on VW Racing. The race is on, the season starts on the 11th April and Martyn foot is still broken, but well on the mend, but will he be ready. Martyn sustained a broken foot when he decided that dropping an engine hoist on it would be a good idea. How wrong he was. The foot is now out of plaster and he's off the crutches and limping his way around, but he's pretty sure that come qualifying time he be on the grid. The season starts with only one car racing. Unfortunately due to technical difficulties the Beetle won't be starting at Oulton Park. Martyn will be driving his Dad's Vento whilst Barrie takes a back seat. Barrie and Martyn will be working hard to ensure both cars will be ready for the Donington Park meeting. Goblin Racing are pleased to announce the launch of their new website. We apologise to regular readers of our previous site for not keeping it updated since 2007. The site created by ITsECPC will be regularly updated with latest news about the team, the cars, the drivers, and the VW Racing Cup. Suggestions for additinal ideas would always be welcome.